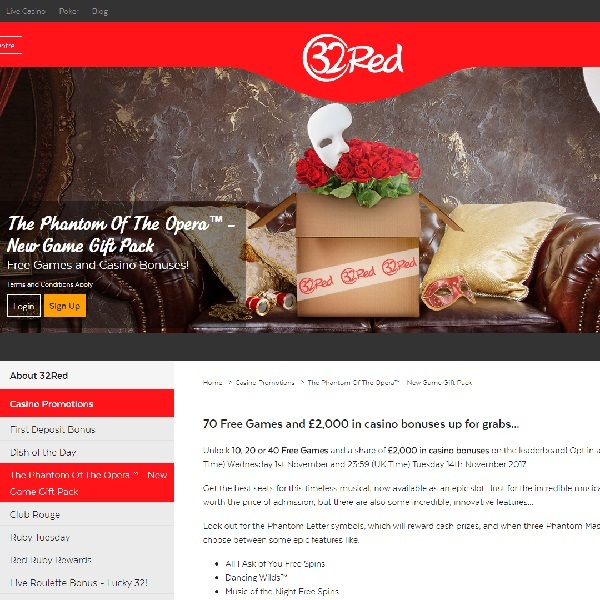 32Red Casino is celebrating the launch of Phantom of the Opera slots by offering you the chance to win 70 free spins and a share of £2,000 in bonuses. You have until Tuesday next week to take part in the promotion and all you have to do is opt in and start playing the game. They have three achievements for you to unlock to win free games. Unlock the Rose Pays achievements for 10 free spins, the Christine Pays achievements for 20 free spins and the Scatter Pay achievements for 40 free spins. At the same time each £10 you bet on the game will earn you leaderboard points and at the end of the competition the top one-hundred players will receive bonuses of between £5 and £500. Make sure you don’t miss out, head over to 32Red Casino and start playing today.